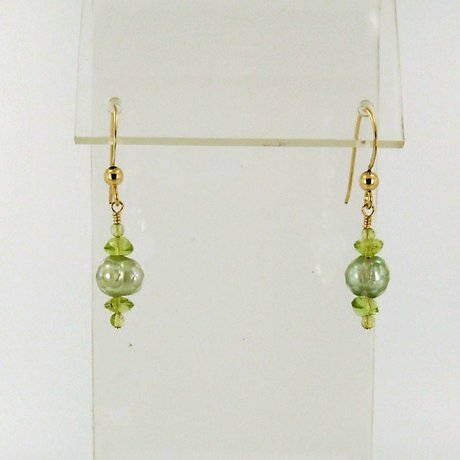 Home :: Earrings :: E0502 - Peridot Lanterns 1.25"
E0502 - Peridot Lanterns 1.25"
The faceted mint green freshwater pearls, highlighted by the Peridot beads seem to glow like little garden lanterns hanging in the summer gardens at evening. Earrings of faceted mint green freshwater pearls, smooth 4 mm Peridot roundels, and 2 mm Peridot rounds. Hung from 14kt gold filled French hook ear wires with 3 mm balls.